The British Gardener - The Tropical years: Garden at your peril ! Can gardening be bad for your health? Apparently so! 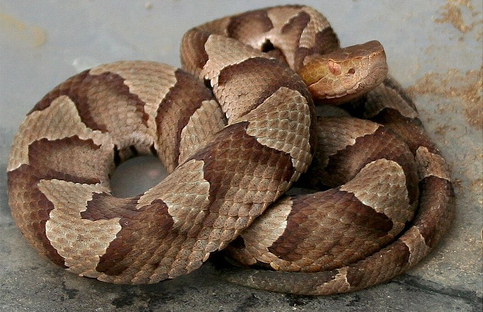 Just last week I bumped into a good friend who was recovering from a Copperhead Snake bite to the hand while pulling a weed from under her Daylilies. Alarmingly, this is not the only account of garden related attacks when you start to dig around on the web. 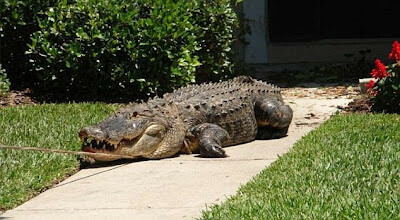 In the north, people have been attacked by Bears while working in the garden; and in the south, Alligators prey on the unwary as they hide out in the shrubbery. Snakes of all types, venomous or not are ready to stand their ground to the unsuspecting gardener not looking where their hands go. I myself have bitten by both Black and Garter Snakes, though not dangerous, they will draw blood with their bite. I even beheaded one that stuck its head out of a boxwood just moments before the electric trimmer swooshed past it. Dare you ever surprise a skunk when turning the corner, make sure you have good stock of tomato soup to bathe in. James Herriot summed it up right with the title of his book 'All Creatures Great and Small' as the smaller ones are just as dangerous as Ticks have become a gardeners worst fear as they now carry Lyme Disease, debilitating you as the disease takes effect. Spiders are the critters that give me the goose bumps, while Black Widows are easy to spot, the Brown Recluse doesn't make its presences known until its fangs are in you. Just today as I was installing some irrigation, my daughter found a Red Velvet Ant walking across the driveway. 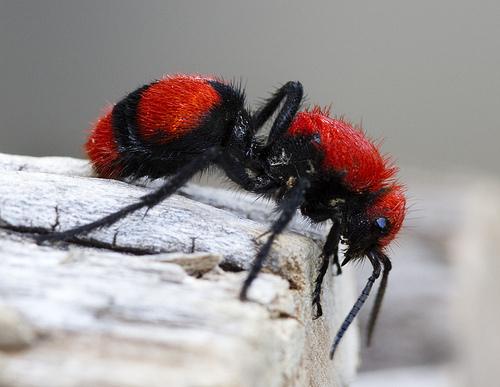 The name appears innocent, leaving you to believe that its a big red cuddly teddy bear but is also known as Cow Killer, in recognition for its extremely powerful sting! Last year I had a run in with baldfaced hornets nesting in a Holly. They chased me out, stinging all the way. Just when I reached safety being stung seven times in the process, I got repeatedly dived bombed by an Eastern Mocking Bird defending her nearby nest site. Mother nature had turned on me that year. However, the next day I returned to the site of the attack and committed genocide on the nest with wasp and hornet spray, laying waste to the holly in the process, but feeling justified in my actions. The Mocking bird, being witness to the annihilation left me alone after that. If the animals don't get you then the plants will. 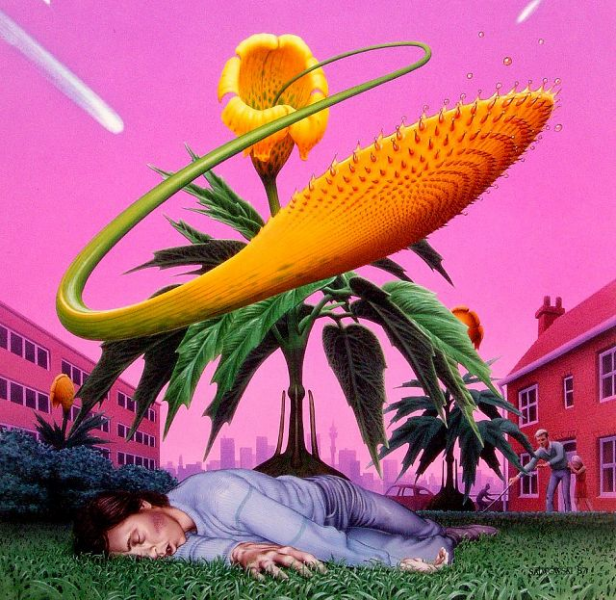 I'm not talking about the fictional flesh eating plants made famous by the 1951 novel, 'The day of the Triffids' by John Wyndham. Instead, the poisonous trio of Ivy, Oak and Sumac are lurking around. At first these weren't such a problem but over the years the increased exposure has broken my own bodies defense leaving me breaking out in itchy watery blisters that spread around the body with ease. Yep, you Brits still in the mother land should consider yourself lucky. The new world isn't for the faint hearted, but instead those looking for a sprinkle of adventure in your flower borders. So, next time you go down to the woods, be sure for a big surprise, it's not just a teddy bear's picnic anymore! I am a transplanted Brit too. I've been facing the gardening challenges of the northern prairies Zone 3, but am about to move to British Columbia Zone 7. I'm aiming to create a cottage garden. Check out my post on the Reader Rock Garden for another transplanted Brit. Sadly too true about T.V. gardening programs. Quiet the zone jump from 3 to 7. I'm a bit jealous, I hear BC is beautiful, one day I'll get over that side of the country and take a poke around. I've lived in Minnesota before and know all to well the limited palette you've had to work with. BC will be a joy. Thank you for posting, I'll follow your adventures closely, Best of British! Let me know if you want a chunk of Louisiana iris 'Red Velvet Elvis'. I promise they don't bite. True gardeners never say no to an offer of a plant! I need to beef up my iris plantings and would gladly welcome a visit from Elvis. Let me know when you're heading by. Ok! I'll be dividing them this fall unless you'd like your daily Elvis sightings to start sooner. :o) I'm very flexible.